Sunspot update for March 2018: the sun crashes! It surely looks like the solar minimum has arrived, and it has done so far earlier than expected! On Sunday NOAA posted its monthly update of the solar cycle, covering sunspot activity for March 2018. Below is my annotated version of that graph. 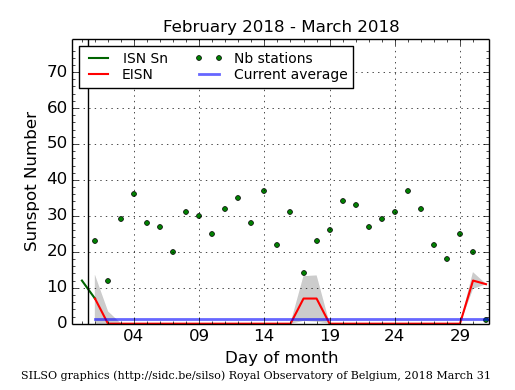 The graph on the right, courtesy of the Sunspot Index and Long-term Solar Observations webpage (SILSO), will give you an idea how little activity occurred in March. There were only five days during the entire month where sunspots could be seen on the visible hemisphere of the Sun. We have not seen so little activity since 2009, when the Sun was in the middle of its sunspot minimum. We could still see a recovery in sunspot cycle. Past cycles tended to ramp down slowly to solar minimum, not quickly as we have so far seen with this cycle. For example, look at sunspot activity during 2007 on the NOAA graph above. Though activity was dropping, throughout the year there were new bursts of activity, thus holding off the arrival of the minimum. It would not be surprising or unusual to see this happen now. Nonetheless, the lack of activity continues. 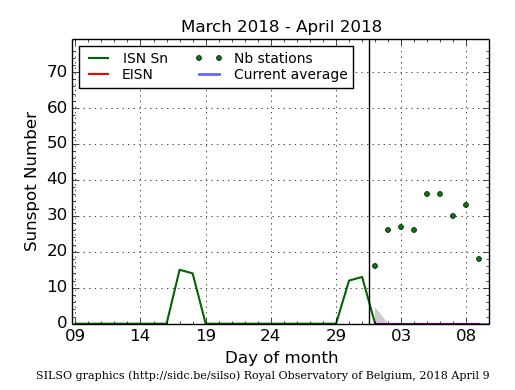 April is now almost one third over, and as shown on today’s SILSO graph on the right, we have yet to see a single sunspot this month. Increasingly, it appears that the solar minimum has arrived, and it has done so one to two years ahead of schedule, based on the green and red predictions of the solar science community back in 2007 and 2009. Furthermore, the occurrence of a grand minimum now would help the climate field. We really do not know the full influence of the Sun’s solar cycles on the Earth’s climate. There is ample circumstantial evidence that it has a significant impact, such as the Little Ice Age that occurred during the last grand minimum, as well as the unusually cold climates that also matched past weak cycles, now, and also in the early 19th and 20th centuries. Studying a grand minimum with today’s sophisticated instruments could help measure precisely how much the Sun’s sunspot activity, or lack thereof, changes the climate here on Earth. And gaining such knowledge is critical. Despite the repeated claims by leftist politicians and activists that the science of climate is “settled,” we really do not have a good understanding of how the Earth’s complex climate functions. There are many large uncertainties, of which the Sun is only one. We do not yet know the full influence of pollution, what climate scientists generally call aerosols. We do not know the full impact of the Earth’s cloud cover. We do not yet know the full influence of volcanoes. And we do not yet know the full impact of the increase of atmospheric carbon dioxide due to human activity, especially because this gas is only a trace gas in the Earth’s atmosphere and is its least important global warming component (water is the global warming ruler here). Filling in the gaps that exist in our knowledge of the Sun’s influence might be only one component in this complex science, but it might be the most important one. Hopefully, the next decade or so will give us some clues to solving this scientific detective story. This is one of your best analysis of the situation Bob. not give it much attention”. Isn’t it true that sunspots have been observed by many cultures in the past, none of which had telescopes and all of which would have noticed both low and high sunspot activity? When the telescope arrived in the early 1600s, that cycle happened to vanish at that time, going into a grand minimum that lasted almost a century. Oh yes, here’s a paper reviewing the history of sunspot spotting (like train spotting?) Well, not “many”, but before the telescope for sure. Problem is that only modern Westerners have kept a reliable track record of it. Other societies were never organized in a way to make that possible for people to do. Astronomers estimate that there is at least one nova per century that would be visible by the naked eye on earth. But none has been documented since over 500 years, Kepler’s nova. However, it has been discovered that a supernova was indeed visible by the naked eye in the early 1800s. But on the southern hemisphere. And no civilized people able to document it lived there then. Just indigenous, Boers, English prisoners and some sailors. No one cared about a new dot on the sky. It’s not so much about what is visible, as it is about who cares. I have to add that there is this Japanese heliophysicist who observes sunspots in ancient ways, as before and early on in the development of the telescope. He draws by hand what he sees. All of this to try to replicate how astronomers historically have observed the sunspots. So that he can use current data on the same conditions as historical data. Getting himself a longer time series. Observational techniques (and now seriously data processing techniques) are continuously changing. Astronomy is changing because WE are changing, not because the universe is changing. Those big mirrors to a large part only reflect ourselves. If we’re entering a grand minimum then you can kiss global warming goodbye. I guess Al Gore can load up on more beachfront property. Thanks to all of you for adding sanity to the climate debate!!! Localfluff noted that there are differences between older data collection techniques and modern techniques and that it is difficult to merge the data from the two in order to make sense of the observations. A current problem we have is that we are now able to observe the far side of the sun with satellites placed in solar orbit. This is why Robert points out, in his fourth paragraph, that these are observations from the visible (Earth) side of the sun. We have a lot of sunspot data from Earth and from Earth orbit that predates these solar orbit satellites, and it is difficult to figure out how to correlate the data from these solar satellites with the traditional visible side data. Some day this new far side data will be part of the primary data that we use. Did I read that correctly that there are only 2 options? If the Earth was maintaining an hiatus with some significant number of sunspots for ~20 years, it would seem that cooling would be a viable 3rd alternative. That plus possible sea level falling. The onset of La Niña in the tropical Pacific Ocean has caused temperatures drop to levels not seen in six years, according to satellite temperature data. “Note that La Niña cooling in the tropics has finally penetrated the troposphere, with a -0.12 deg. C departure from average,” wrote atmospheric scientists John Christy and Roy Spencer, who compile satellite data at the University of Alabama, Huntsville. Satellite data, which measures Earth’s bulk atmosphere, show temperature anomalies dropped from 0.41 degrees Celsius in December to 0.26 degrees in January. The temperature drop was brought about by a La Niña cooling event in the tropics. The correlation of sun spots and temperature is well documented as is the reality that solar radiation not Co2 is the driving force of climate change. Beware, we are losing the great benefits of a warming climate! It is pretty clear that some factor, probably natural, has a greater effect on Earth’s temperature than CO2, because for the past couple of decades the temperature has stabilized (we are saved(! ), probably due to the Kyoto agreement), yet CO2 in the atmosphere has continued to climb. CO2 and temperature are not as well correlated as many claim. We also know that when temperatures go up, CO2 in the ground is released into the air, so the cause and effect between CO2 and temperature are not as clear as claimed, either. I do not like this reCAPTCHA you have on here BZ. In the follow up post, a solar physicist, Dr, Leif Svalgaard, asserts that the new sunspot just observed belongs to the next solar cycle, as evidenced by its polarity and its position (about 30 degrees latitude). It had never occurred to me that solar cycles overlap (no surprise, my knowledge of sunspots is not very deep). I’m inclined to believe the good doctor on that point, but I think he’s getting ahead of himself by asserting that the new sunspot proves that there will be no protracted solar minimum, and solar cycle 25 (the next one) will be stronger than the present cycle. There has also been a protracted discussion on that site asserting that sunspots have no affect on temperature, mainly because there is no evidence of an 11-year cycle in temperature. I would argue that perhaps the sunspot cycle is dampened by the retention of heat in the oceans, delaying the cause and effect, and a protracted minimum would lead to cooling, perhaps with a delay of a few years or decades. Garry: Thanks for the heads up. Though I appreciate greatly Anthony Watts plugging my post, I think it a bit inappropriate for him to repost it entirely, on his site, without even asking me. I think I’ll shoot him an email about this. Garry: As for the science of the followup post at Wattsupwiththat, the scientist is quite correct. The cycles always overlap, and the sign that the next cycle is beginning is when we spot the first reverse polarity sunspot. I’ve been waiting for news of this, and tt appears he has done so, though the sunspot hardly lived long enough to be ranked one. The correlation between the sunspot cycle and temperature is not directly related to the number of sunspots at any given instant (not related to where we are in the cycle) but seems to be related to factors associated with the cycles, such as the cycle period and the cycle strength. I have seen a chart (but cannot find, right now) that shows that the length of the cycle correlates well with whether the we are in a period of rising or declining temperature. The reaction to sunspots, if there is a cause/effect relationship, does not seem to be instantaneous. Even the observed historical relationship between rise in temperature and increasing CO2 levels has an observed lagtime of many decades, where long after temperatures rise then CO2 rises. Is it possible that we could have a double dip solar minimum that mirrors the solar maximum? donald penman: Interesting thought. I have no idea, as the Sun will do what the Sun wants to do. We shall find out. I suspect that solar activity had a greater effect on climate prior to the industrial revolution. In recent times, it would be swamped by carbon loading. And much of the debate seems to be swamped by disinfo funded by the Koch Bros. and I suspect, whoever funds WattsUpWithThat. That research however does suggest that the Sun is far more influential, and that the influence of CO2, a trace gas in the atmosphere, has been greatly overblown by politicians and environmentalists, mostly for political reasons to increase their power. As a meteorologist, I must argue that the science is not in, with individuals who have degrees in geology to teaching high school. They have killed the mention of C.L.O.U.D., Dr.Svenmarks theory on weak solar period cloud seeding, by the cosmic ray and the opposite from the grand maximum that appears to have ended. It seems we overlooked the /Sun may have 11 and 340-year cycles and who knows?The science is not don. The standard model of quantum physics completed everything but gravity. We knew it was not complete. C02 is a trace gas and as one said water vapor rules. But the computer models that are god for7 days are telling us the temperature 100 years from now. Thanks, space weather no politics here just give some research money to those of us who believe the Grand Maximum of the space ERA temps follows nicely when graphed. Thank you for your article and the responses. I bought my solar telescope about 3 years ago and I was having fun see the action on the sun. Now at it’s minimum, I can get just plane, but cool photos. 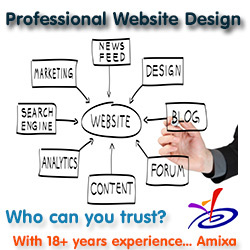 I hope that very soon we can see some more stronger and interesting action. I’ll just have to be patient. I recently read a report that describes the correlation of sunspots actively and the temperature of the sunspots. The conclusion showed a graphed result that showed a sharp decrease of sunpot activity in last cycle and also a correlation of the decrease temperature of the temperatures of each sunspot which showed the possible approach of solar grand minimum. What required fields are in question? Wh Bahr: I do not understand the question. To what are you referring?